Grow your business with minority and small business certifications. 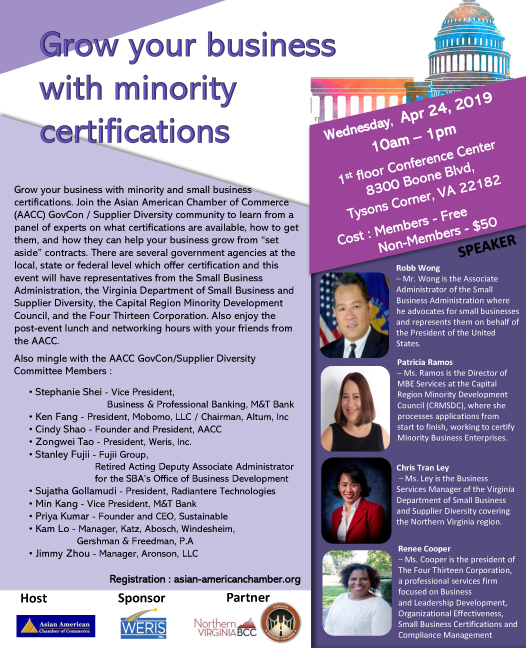 Join the Asian American Chamber of Commerce (AACC) GovCon / Supplier Diversity community to learn from a panel of experts on what certifications are available, how to get them, and how they can help your business grow from “set aside” contracts. There are several government agencies at the local, state or federal level which offer certification and this event will have representatives from the Small Business Administration, the Virginia Department of Small Business and Supplier Diversity, the Capital Region Minority Development Council, and the Four Thirteen Corporation. Also enjoy the post-event lunch and networking hours with your friends from the AACC. Non-member can use code: Special30 to enjoy $30 off for Advance registration before April 5th.